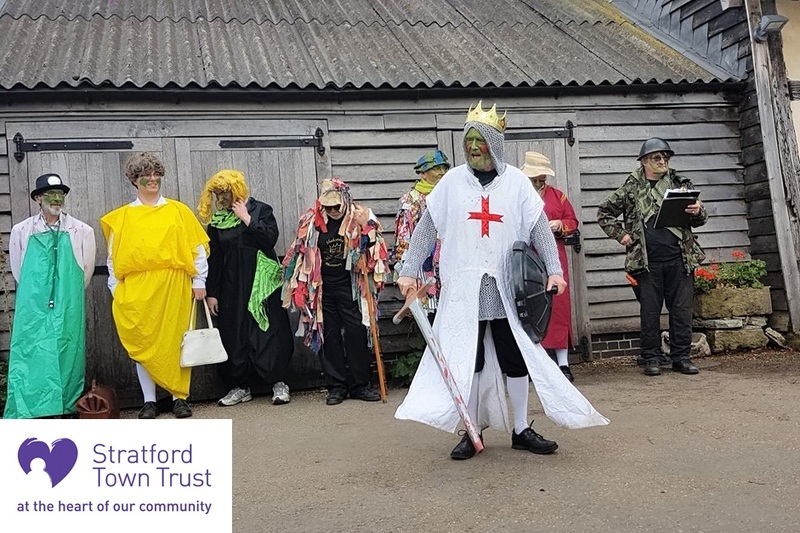 As well Morris dancing, Shakespeare Morris also have an extremely active Mummers group. We mainly perform in the lead up to Christmas, and through to twelth night. However we also perform on several special occasions during the year such as St Barnabas day and Apple day. Mummers' plays are a last vestige of the old fertility rites performed in mid-winter to bring life back to the world. They are related to similar myths and legends world wide, such as the Greek Myth of Persephone. Like these, the Mummers' play always has a cycle of death, followed by resurrection by magical means. In the Mummers' plays this cycle involves a fight between the Hero and the Villain in which one (or both) get killed. The corpse is then magically brought to life again by the Doctor. There then follows some 'business' by other characters, mainly as an excuse to extract money from the audience. This money was traditionally spent on drink and was probably one of the main reasons for the preservations of the plays up to the Victorian times, when such goings on started to be looked down up on. The plays were passed down orally and some have became garbled over the years, as each player would only know his (never her) own part, not those of the other players. This has lead to some strange lines and names, for example in one play the villain's name has changed from the Turkish Knight into a turkey snipe. There are over 900 Mummers' plays of one sort or another recorded in Britain and the names of the Hero and Villain reflect local traditions. The Hero is usually England's Patron Saint, St George, although in some plays this was changed, presumably in Hanovarian times, to King George. Some Scottish Mummers' plays have William Wallace as the Hero. The Villain varies more widely and he may be the 'Bold Slasher', the 'Turkish Knight' or the 'Black King of Pardine'. In some plays from the south of England, 'Old Boney' (Napoleon) makes an appearance as the Villain.